Born in South Africa, 1981, an interest and passion for the natural world has always been with me. My earliest artistic inclinations were evidenced by drawings of wildlife created during family trips into the African bush. I was fortunate enough to have had the opportunity of living in the Kruger National Park, a perfect foundation for my chosen subject. Through my works I intend to portray the beauty of our living system and the profoundness of its volume. Africa is particularly blessed with its vast open spaces and secret places, dramatic seasons and variety of life forms. 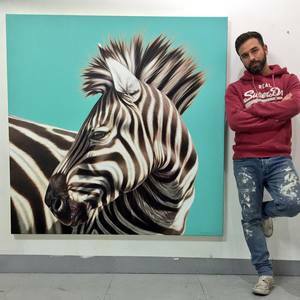 My goal with my artwork is to isolate the subject, making use of a cinematic cropping of the animal, sometimes using the perimeter of the canvas to achieve a feeling of the subject being up close and personnel. In doing this, the subject appears to project further than the plane of the canvas, creating a presence, and placing the viewer somewhere in the physical experience of the painting.